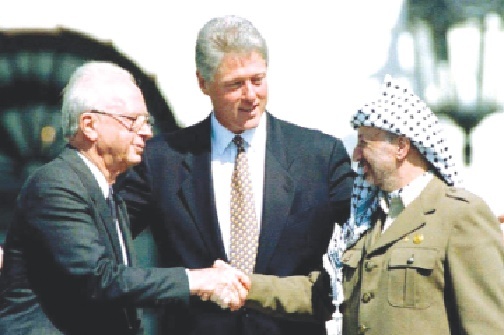 CNN: On this day in 1993, Chairman of the Palestinian Liberation Organisation (PLO) Yasser Arafat and Israeli Prime Minister Yitzhak Rabin, shook hands after signing the Oslo peace accords, in what would become an iconic moment in the history of the Israeli-Palestinian conflict. Yet 25 years later, the promise of peace remains unfulfilled and the struggle for a Palestinian homeland continues, with the failure of Oslo increasingly acknowledged. “The difficult decision we reached together was one that required great courage,” said Arafat in his subsequent speech. “Our two peoples are awaiting today this historic hope, and they want to give peace a real chance.” The handshake made front page headlines across the world, hailed as a historic triumph of peace over conflict by media outlets and politicians. The signing of the Oslo Accords brought an end to the First Intifada, which had seen hundreds of Palestinians killed and thousands injured after Israel responded violently to the popular uprisings across the occupied territories. In 1994 Arafat and Rabin received a Nobel Peace Prize for their participation in the accords. Arafat was also elected president of the newly established Palestinian Authority (PA) the same year, which paved the way for the signing of Oslo II in 1995, which affirmed the establishment of a Palestinian interim self-government. Neither accord promised future Palestinian statehood.